This book is about how languages change. It is also a devastating critique of a widespread linguistic orthodoxy. April McMahon argues that to provide a convincing explanation of linguistic change the roles of history and contingency must be accommodated in linguistic theory. She also shows that theoretical work in related disciplines can be used to assess the value of such theories. accounting for language change, without the addition of rules and an appreciation of chance and historical contingency that would then undermine its theoretical underpinnings. OT relies on innateness and needs to discuss the origins of allegedly genetically-specified features. 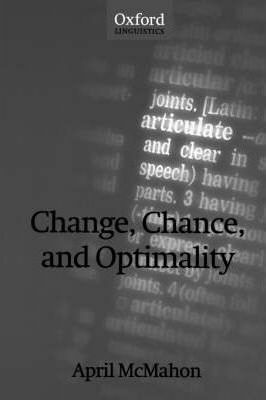 The author considers the nature and evolution of the human language capacity, and demonstrates a profound mismatch between the predictions of evolutionary biology and the claims for innateness made in OT. long-standing research interests in the relationship of phonological theory and sound change, and in interdisciplinary issues including connections between evolutionary theory, genetics and historical linguistics.